Enjoy our free resource of a vast amount of information extracted from historical light lists. The researched light lists are those published light lists which have been fully researched and whose information is presented within these web pages. You may display information by a light list volume. In the early years of light lists, all of the lights could be listed in one volume. As more and more lights were added, additional volumes per year were required. For example, in 1960, all of the lights were contained in three volumes (Atlantic and Gulf Coasts, Pacific Coast, and Great Lakes). As another example, in 1974, all of the lights were contained in four volumes (North Atlantic, South Atlantic and Gulf Coasts, Pacific Coast, and Great Lakes). Today there are seven Coast Guard regions in the United States, and there is a light list for each region. NOTE: Many of these light lists contained Great Lakes lights, but some did not. However, since the Great Lakes lights have not been fully researched yet, they will not appear when displayed on this website. NOTE: Multiple lighthouses were found in the 1839 and 1849 light lists, which contain very basic information, that did not have a characteristic specified for them. In these cases, those lighthouses will be not included as researched lighthouses during those two years may or may not have been included; if included, a fixed characteristic was assumed. 1 The 1870 List of the Lights on the Atlantic, Gulf, and Pacific Coasts of the United States was not available in 2007 when the Pacific coast research is being done and, thus, the lights for the Pacific coast are not displayed for that area. 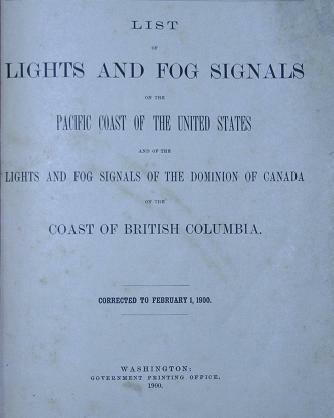 2 The 1888 List of Light-Houses, Lighted Beacons, and Floating Lights on the Atlantic, Gulf, and Pacific Coasts of the United States that was researched had a few missing pages specific to Oregon and, thus, the lighthouse information for the Oregon lighthouses is not included for that year. 3 The 1888 List of Light-Houses, Lighted Beacons, and Floating Lights on the Atlantic, Gulf, and Pacific Coasts of the United States that was researched had a missing page that contained the structure description, tower height, and fog signal information for the following lighthouses in northern California: Point Reyes, Point Arena, Cape Mendocino, Humboldt Harbor, Trinidad Head, and Battery Point. The tower heights and structures descriptions (not as informative) for these lighthouses was extracted from the 1888 List of Beacons, Buoys, Stakes, and Other Day-Marks in the Twelfth Light-House District, Embracing the Sea-Coast and Bays of California; since this light list does not contain fog signal information, that information will not be provided for these lighthouses. 1 The 1943-1952 light lists, for some unknown reason, did not contain the following lights: Amite River, Bluff Shoal, Croatan Shoal, Gull Shoal, Laurel Point, Long Shoal, New Canal, Pamlico Point, Pass Manchac, West Rigolets, Southwest Point Royal Shoal, Tchefuncte River Range Rear, and Wade Point; these lights reappeared in the 1953 light list. Additionally, the following lights were not contained in these light lists: Bayou St. John, Harbor Island, Neuse River, and Roanoke River; these lights were deactivated during that time period. NOTE: During the research of the North Atlantic lights in 2011, the 1940 Light List - Atlantic Coast of the United States, the lights in Maine through Delaware were extracted. This light list supposedly contained all of the lights on the Atlantic and Gulf Coasts, but that information was not extracted at that time. However, during the Mid-Atlantic, South Atlantic, and Gulf Coast research that was done in 2014, this light list could not be relocated for research and, thus, the lights in those area cannot be shown. 1 These light lists were not available for research in 2014 during the Mid-Atlantic and Gulf Coasts research. Therefore, states south of Delaware through North Carolina are not listed in these light lists. 2 The 1978 Light List - Volume I - Atlantic Coast of the United States - First, Third, and Fifth Coast Guard Districts that was used for the research had some blank pages near the end of the book. Thus, certain lights that were being researched were missing in this light list but then were listed in the 1979 light list. These lights are Bluff Shoal, Croatan Shoal, Northwest Point Royal Shoal, Oliver Reef, Pamlico Point, and Roanoke Marshes. 1 The Light List - Volume I - Atlantic Coast - St. Croix River, Maine to Shrewsbury River, New Jersey ends in Shrewsbury River, N.J. instead of Toms River, N.J., but these two locations are pretty close to each other. 1 The Light List - Volume II - Atlantic Coast - Shrewsbury River, New Jersey to Little River, South Carolina starts in Shrewsbury River, N.J. instead of Toms River, N.J., but these two locations are pretty close to each other. The following table shows the light lists that have been researched that only contain the lights of the Gulf Coast in the United States from Econfina River, Florida, to Rio Grande, Texas. 1 Although the researched 1857 light list contained lights for all of the United States, this light list was only available for research in 2007 when only the Pacific coast was being researched. 2 These light lists do not contain reference numbers, focal planes, or fog signal information. Furthermore, the structures descriptions tend to be less informative. 3 The 1913 Pacific Coast of the United States - Buoy List Alaska - Sixteenth Lighthouse District does not contain reference numbers or tower heights. Furthermore, the structures descriptions tend to be less informative. The missing light lists are those published light lists which we have not been able to locate yet for our research. Since the Lighthouse Board was established in 1852, only the years starting in 1853 are desired even though several light lists before 1853 have been researched. If you know where the 'missing' light lists are located and available for research, please contact us on how we can possibly get our hands on them, or at the least where they are located. Please include the light list name and the years of the light lists if known. Also please contact us about other area light lists that may be available so future research of the lighthouse characteristics in other states will be successful; it is our hope to research all of the U.S. states, one area at a time, and present this research on this website, but this will take a while. If you have one or more of these missing light lists but you are not comfortable about sending them to the USLHS, also please contact us about these missing light lists; we are sure that a copied or photographed light list, or possibly something else will suffice.